The first line of Dijon Tramway was opened in September 2012. Image courtesy of Prosopee. The Dijon tramway received the best environmental project award for 2012. Image courtesy of Pline. The Tram lines cover several prominent locations in and around Dijon. Image courtesy of Claude villetaneuse. The two tram lines, T1 and T2, together cover 37 stations. Image courtesy of Claude villetaneuse. The initial line of the Dijon Tramway System, T1, was inaugurated at Dijon, France in September 2012. T2, the second line of the tramway opened in December 2012. The two lines cover a distance of 20km. "The two lines are used by an estimated 87,000 people every day." Line T1 is 8.5km long and T2 is 11.5km long. The entire tramway system includes 37 stations. The tramway, which is operated by Keolis, was constructed by means of a public-private partnership involving Grand Dijon Urban Authority and Cofely Ineo. The Tramway System secured the 2012 best environmental project award. The Dijon tramway was completed with an investment of approximately $550m. The tramway construction generated approximately 6,700 jobs. The two lines are used by an estimated 87,000 people every day. The new tramway meets the travelling needs of the Greater Dijon population, especially of employees and students. The project is a primary element of the programme aimed at developing urban transportation infrastructure in an environmentally friendly manner. The tramway passes through several commercial zones in the city. Approximately 76,000 people reside within half a kilometre of the stations constructed along both the lines, with about 38,000 of those being students. The park-and-ride facility of the tram system is projected to minimise the volume of traffic in the city, by prohibiting cars on some specific roads. France is rapidly developing a world class high speed railway network, and the grand plan has been enhanced by the approval of a funding package worth €2.3bn for the first phase of the TGV Rhine-Rhone high speed line. Additionally, the Citadis tram set being used on the lines is designed to emit a low level of noise, which is five decibels quieter than that of average road traffic. The energy consumed by the tram sets is ten times les than buses, and even the greenhouse emission levels are much lower when compared with those of a car. There has been a growth in commercial activity of Dijon, with the arrival of the new tram lines. Place de la République, which is the point where the T1 and T2 converge, is steadily developing as the new hub of Dijon. Several new restaurants and cafes have been opened along the tram line. The tram route runs through the city centre and several other locations in the vicinity of the main hospital, University of Dijon and football stadium. It also covers the residential and commercial zones of Chenove, Quetigny, Toison and Grésilles, and the new Valmy Commercial Centre. The T1 passes through 16 stations starting from Dijon Railway Station to Quetigny, while T2 covers 21 stations of the Valmy- Chenove stretch. Interchanges are formed at the Dijon-Ville station to ensure that the passengers have convenient access to other means of transportation. Six shelters to park bicycles were provided at important stations. The tram sets running on the Dijon Tramway System are of the sophisticated Citadis family of Alstom, which are manufactured to provide maximum comfort to passengers. The Citadis tram sets feature integral low floors, closed-circuit video surveillance and passenger information systems. Each tram set is 33m long, and can accommodate more than 200 passengers. The sets are designed to reach a top speed of 70km/h. "Line T1 is 8.5km long and T2 is 11.5km long. " The contract for supplying 33 tram sets for the Dijon Tramway System was awarded to Alstom. Cofely Ineo was selected to design and construct the electrical systems for the tramway. The contractor will also provide maintenance services for command systems and electrical equipment for 26 years. 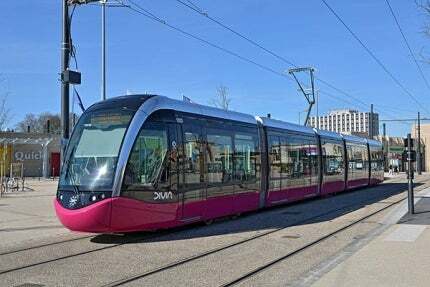 The European Investment Bank (EIB) provided approximately €200m ($262m) for the Dijon Tramway Project. The funding from EIB encompasses construction of T1 and T2, procuring tram sets, and building two ride and park facilities.